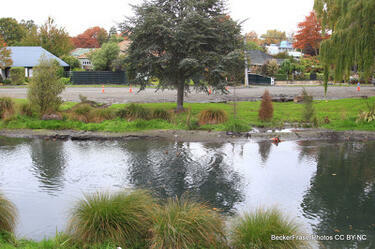 A film directed by Christchurch East Youth MP Beth Walters, produced and filmed by Lila Gibbens. The film captures the views of more than 50 young people from Aranui High School, Linwood College and Mairehau High School. How do you feel about living in the East? What don't you like about living in the East? 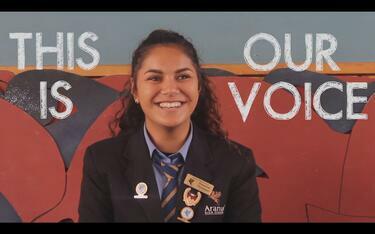 Do you, as a young person in the East, feel your voice is heard? The film features an original song produced by three Aranui High School students: Cheyenne Thompson (lyrics), Evile Jireh Sisifo Laloata (vocals) and Peni Junior Iva (guitar). A view down a New Brighton Road next to the river. 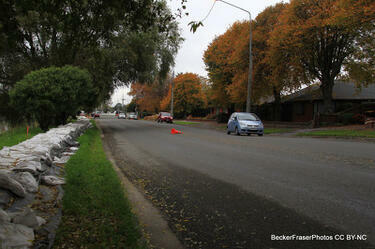 On the left sandbags have been placed on the banks of the river to prevent flooding onto the road. 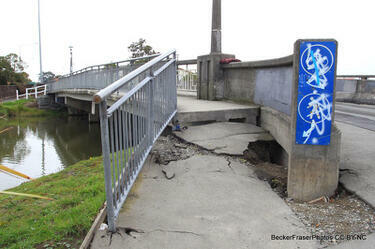 The earthquake caused the ground to subside and sink, making this area susceptible to flooding. 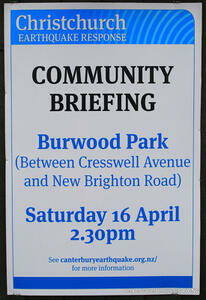 A community briefing sign for Burwood Park, between Cresswell Avenue and New Brighton Road. These signs were put up in Christchurch for each community briefing. The first series (6 March to 12 March) were held in 12 locations, second series (21 March to 26 March) in 10 locations and the third series (16 April to 18 April) in 8 locations. Photograph captioned by BeckerFraserPhotos, "Extensive slumping and cracking near where Horseshoe Lake joins up with the Avon River". Plastic barriers and fencing around a demolition site on the corner of Cranford and Westminster Streets. Different types of building rubble have been sorted into piles, and a concrete block still remains on-site. Plastic barriers and fencing around a demolition site at the corner of Cranford and Westminster Streets. Different types of building rubble have been sorted into piles, and a concrete block still remains on-site. 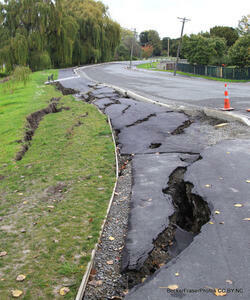 Photograph captioned by BeckerFraserPhotos, "Large cracks in the footpath of Cambridge Terrace where the road is slumping towards the Avon River". 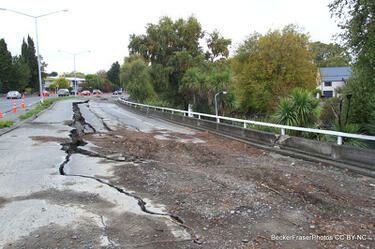 Photograph captioned by BeckerFraserPhotos, "Extensive cracking to the Wainoni Road bridge. There has been a vehicle weight limit of 3500kg placed on the bridge. A person was placed on duty at all times to police this". 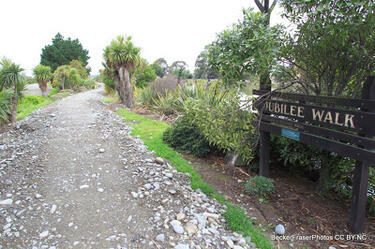 The start of the New Brighton Jubilee River Walk, next to the Avon River and the Estuary. 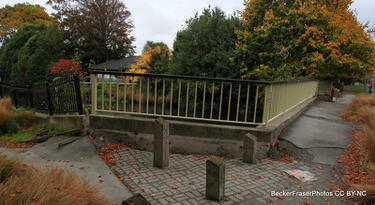 The Council has built a stop bank along the walkway. A banner on the fence of Burwood Primary School expressing the student's appreciation for the efforts of the civil defence, fire service, volunteers and council workers with a banner on their school fence. 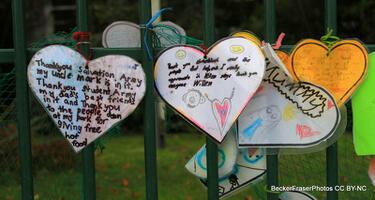 On each heart-shape note is a personal message from the students. 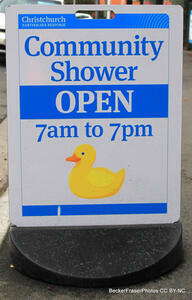 A sign outside a community showering facility set up at the Burwood Primary School. The sign reads, "Community Shower. Open 7am to 7pm". 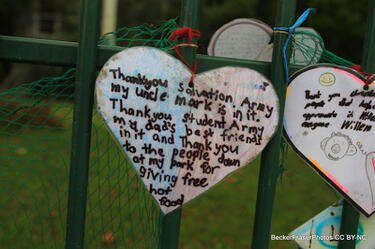 Heart-shaped notes on the fence of Burwood Primary School. The notes express appreciation for the efforts of the civil defence, fire service, volunteers and council workers from the students of Burwood Primary. A view over the Avon River towards Oxford Terrace. 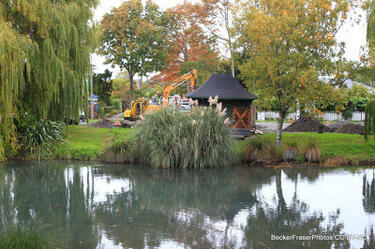 A small digger can be seen at work to the left. A protest sign painted on a fence shows a bulldozer labelled "Govt." 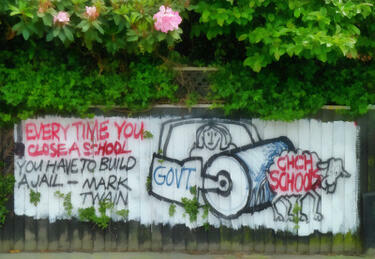 driven by a woman (presumably representing Education Minister Hekia Parata) running over a sheep labelled "Chch schools", next to the words "Every time you close a school you have to build a jail - Mark Twain." 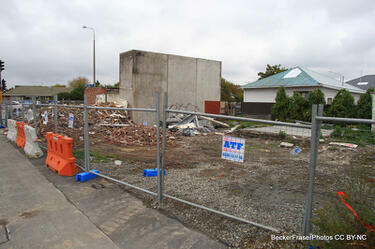 The photographer comments, "Due to the earthquakes in Christchurch and parents leaving the area to give their children a quieter and more education friendly life a lot of the local schools especially in the East of Christchurch are to be closed or amalgamated. This was a decision by the government without consultation with any other authorities. Mark Twain actually said 'Every time you stop a school, you will have to build a jail'". 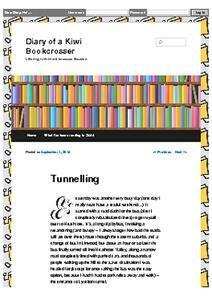 An entry from Jennifer Middendorf's blog for 1 September 2014 entitled, "Tunnelling". 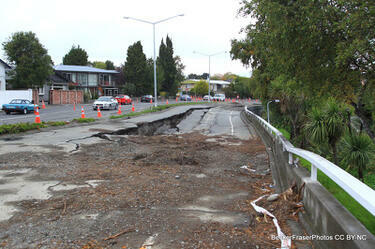 Large cracks on Fitzgerald Avenue, closing one side of the road. Road cones have been used to indicate two lanes on the other side. 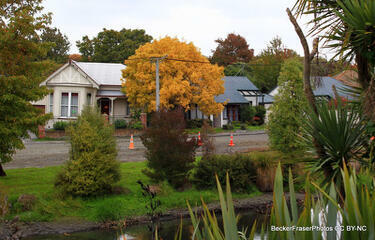 A house on Oxford Terrace which has been badly damaged by liquefaction. The left side has slumped badly.